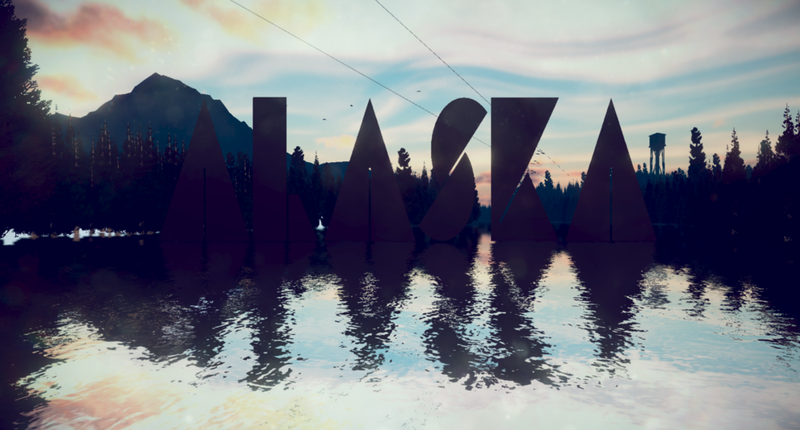 Besides from possessing an intriguing concept, ALASKA’s script, visuals, soundtrack, and gameplay all fail catastrophically. In ALASKA, you take control of Blake, a man whose wife has just left him for an unknown reason. As you go around a small village hunting, fishing, and ice skating, you find that one of your neighbors has been murdered. ALASKA is driven by its narrative, but it doesn’t feel like a game. It’s more akin to a walking simulator that makes you play meaningless mini-games in between story bits. Additionally, you cannot make any choices throughout the story, and you’re instructed on where to go every time. The entirety of this game has no true interactivity or choice embedded within it. It’s nothing more than a movie that allows you to walk around the setting. This is especially evident considering how terrible the mini-games are. The first mini-game that is introduced to you is one where you go fishing with your neighbor. To complete this, you click to throw your hook, and then when the bob lights neon green, you press a button to reel it back in. The game makes you do this three times and it feels utterly pointless. There’s no enjoyment to be had here, as you can’t move your character, the rod, or the hook, and you are not presented with a sliver of challenge throughout its entirety. Another mini-game has you cutting down a tree with another one of your neighbors. This is a simple Simon Says system where you press the buttons that the game tells you to. It’s jarring how little effort is put into this, as there’s no flashiness or liveliness. These buttons are lit neon colors which look terrible in contrast to the gloomy landscape of Alaska, and the tutorial buttons simply flash up when they could’ve just been placed on the side for ease of viewing. Not only that, but the animation for the tree cutting looks sloppy, with the chainsaw floating in midair and approaching the tree rigidly. There’s also a point where you go ice skating, and only the skates move around while traversing some wild and wacky rink with saws for obstacles. It’s hard to imagine that ALASKA is meant to be a horror game when it presents such a silly atmosphere. There’s also no death animation when you fail to traverse properly. You’re expected to finish this course three times, and if you die once, you go back to the beginning. Although this wasn’t hard, it was even more infuriating, considering how poorly made it was. Finally, there’s a hunting mini-game where you take a rifle and try to shoot a deer. However, you don’t even get to chase it. Instead, the deer is miraculously shot by someone else and you have to approach it to take it out of its misery. You get to shoot the deer, but there’s no animation for the deer being shot, or for it halting movement. The game goes straight to a cutscene once you pull the trigger. Sometimes poor gameplay can be made better by good writing and solid performances. However, ALASKA has neither of these. The main character, Blake, is not only obnoxious with his constant monologuing, but the poor voice acting doesn’t help. It’s even worse that the characters have distorted facial animation. The concept of this story is certainly intriguing, but its attempt at making you sympathize with Blake and his community of neighbors fails. As much as the writer tries to, no character comes off as charming or compelling. The script choices feel incredibly unnatural, as many filler words are thrown into conversations to imply that these decisions were made and revised many times. ALASKA fails to understand that people don’t talk to each other with a series of revisions in mind, and to try so hard to make it seem like natural conversation will only make it unnatural. Not only that, but the subpar voice acting doesn’t help. This isn’t as bad when casual conversations are happening, but when we see someone die and are meant to be thrilled, intrigued, or horrified, the main character's failure to deliver his lines properly breaks the immersion. To top it all off, the microphones that are used to pick up this dialogue aren’t any good. What they use to record voices somehow sounds worse than the average smartphone mic. Finally, this effect is amplified with a lack of proper facial animation. All of the characters have doll-like faces, and they move their mouths rigidly. It looks outdated, and to price something so crudely done at $7.99 is ludicrous. The soundtrack is certainly the best part of ALASKA, but this is mainly because there are a lot of classics played throughout. For example, pieces like Moonlight Sonata by Beethoven play throughout the story. Although the original music is fine, the timing of this music is strange. While you do normal things like cutting down a tree, a very intense and thrilling piece accompanies the scene. You could argue that it’s meant to have some other significance, but this is clearly not the case considering how your neighbor cheers you on playfully as you cut it down. There’s too much tonal inconsistency which has you laughing rather than keeping you engaged. The visual quality in general makes it difficult to take seriously, as well. There’s a moment where you see someone running from you, and as you chase them, they sprint while floating slightly off the ground. Not only that, but their running animation is so generic and simple that it’s slightly comical. There’s also a moment where you’re chasing this same person, and a herd of deer cross in front of you, creating a jump scare. The animation of these deer running across is so silly that it was hard to feel scared. ALASKA is a game that fails to accomplish a single thing it sets out to do. It clearly has ambition, especially with how it tries to form its story, but the lack of polish from the title holds it back. It’s also hard to cut it slack when it’s priced at $7.99. ALASKA is worse than many free to play games out there, so expecting consumers to purchase it at such a price is ridiculous.